. I suppose that back in 1959 it looked futuristic and space-age. Today it looks … I don’t know what. 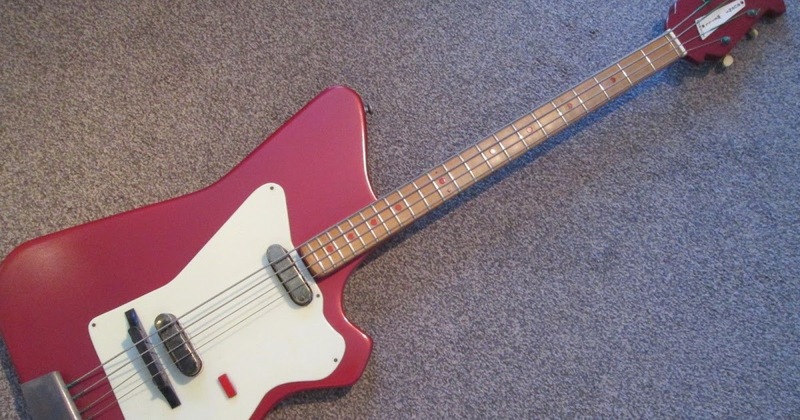 It’s an ugly bass for sure but probably not as hideous looking as those ghastly singlecut jobbies with the bass-side bout extending half way up the neck which seem to be unfathomably popular these days in bass playing circles. It’s quite recognisably a design from the Burns stable, displaying future echoes of the Burns Flyte on the treble side of the body. This particular bass came from the collection of Mark Griffiths – bass player for The Shadows. It was sold in auction some time ago along with many other guitars and basses owned by Mark Griffiths. I did not manage to buy it then but a while ago I contacted the buyer and managed to purchase it. It is totally original apart from the fact that it had been refinished in the past – possibly when Mark owned it. It is a very rare bass regardless of previous owners and its actually the only one I have come across. It has two pickups with volume, tone and blend controls plus a pickup selector switch and two-way switch – all working well, and it is a very nice playing bass with a lovely neck, quite narrow but very playable with twenty-two frets with red dot markers and a scale of thirty inches.